I will start with Laurie this month. First of all she was released as the 2nd Counselor in the Relief Society Presidency and then 26 seconds later she was sustained again as the 2nd Counselor in the Relief Society Presidency. Our dear friends and neighbors across the street, the Walkers, are moving to Midway. Sister Walker has been the Relief Society President and one of Laurie’s close friends for many years. The sister that was called to take her place, kept some of the members of the Presidency. So Laurie gets to keep on trudging along. Overall, I think she enjoys the calling, all except having to give the lessons and conduct. She could do without those two things if she had the choice. Anyway, back to the Walker family, their kids are the same age as many of our kids, so they are going to be sorely missed. Shane, Miranda and Mollie won’t have their buddies just across the street to play with anymore. Staying with the Laurie theme, she is going to California to spend a week with her mother which will be good for the two of them. The rest of us will have to fend for ourselves. It always gives us a good dose of reality when Mom leaves for a week. We certainly gain a better appreciation for all she does. Laralyn has her tonsils out a few weeks ago and is struggling to recover. It has not been easy. It is a good thing she married such a patient kind husband in Rodney. Prior to getting married, Laralyn was hardly sick a day in her life. Since she got married, she hasn’t had a day that she hasn’t been sick. Bethany still works for the hospital, Austin is looking for a job for the summer, Macall is busy making plans and looking forward to EFY, Youth Conference, Girls Camp and just a lot of having fun this summer. Bryce is going to work on his eagle project and said today that he wants to try out for the play here at the Draper Theatre (Peter Pan). Shane is our little baseball star these days. He had a slow start this year but he is playing awesome here at the end of the season. The last two games he has hit the ball clear over the center fielder’s head. He got a homerun, a triple and batted in two runners in the last two games. His coach gave him the game ball last game for catching a fly ball in the outfield and hitting the home run. He got a new bat and helmet for his birthday and has been making good use of them ever since. Miranda is our big news this month. She was baptized on Saturday and we want to thank those of you who came to support her. She looked very cute in her white clothes and was very excited about getting to be baptized. Mollie graduated from Preschool this past month and is excited to start kindergarten next year. I got interviewed by the Salt Lake Tribune about our wellness program and the story landed on the front page of the Sunday paper a couple weeks ago. Well that catches you up with what is going on around here. Have a great summer. Let’s see, what has happened around here lately. Well, Shane got the game ball from his coach the other day for playing an awesome game of baseball. Bryce broke his collar bone by playing football at middle school. Laralyn caught mono and will be out of commission for a while so Rodney gets to do all the chores. Austin broke the prior record at Hagerman’s for eating the most servings of French toast (16 pieces). Mollie learned how to ride her bike, now she just needs to learn how to stay out of the street. Miranda is going to turn 8 this month and get baptized. Macall did an amazing job in her middle school’s dance company presentation. Bethany loves to control the TV remote and Laurie loves digital scrap booking and me. I am trying to pay the bills from the wedding and we all got a new stone fence along the back of our yard. Well I guess that pretty well sums it up. We love you all. Here it is April 6, 2008, the real birthday of Jesus Christ. Being conference weekend, things are not as busy as they usually are. It was good to listen to conference yesterday and participate in the solemn assembly to sustain our new prophet. I can’t help but reflect back on my days in junior high when I shared a locker with Clark Monson, President Monson’s son. At the time, I remember thinking, with President Monson being so young, there was a very good chance that he would be the prophet someday. Sure enough, that happened. I enjoyed hearing President Monson’s first conference address last night at the priesthood session. I couldn’t help but think how well he will pick up where President Hinckley left off.Around our house, baseball has become all consuming. Both Shane and Bryce are playing on little league teams. Shane is on the Angels and Bryce is on the Marlins. It seems like someone has a game or practice every day. The weather has not been real great for baseball the past few weeks. They keep having to play and practice in the shivering cold. Macall has been playing basketball with the ward’s young women’s team. They did very well and took 3rd place in the region tournament. Bethany is enjoying her work at the Intermountain Medical Center in Murray. She is very interested in going into the medical profession. She works in Central Processing where they sterilize the surgical instruments. She gets all excited when they get to see blood and gore that comes down from the surgery floor. The other day she was all excited to tell about the ball joint she got to see from a knee replacement surgery that came down. Austin is enjoying his computer technology and repair class and loves to take apart and put back together computers. He worked along time on installing Windows XP on an old computer that we have. He was pretty happy when he finally got it to work. Miranda and Mollie enjoy playing together and with their friends in the neighborhood. Laurie stays busy in her calling in the relief society, sewing, blogging, scrap booking, baking, and of course everything that goes along with keeping the family organized and in clean clothes. We love you all and wish you a great month of April. Well, around our house, Laralyn’s wedding has been the focus for a long time. Yesterday was the big event and we are glad that everything went as well as it did. We want to thank all of your for your support, generosity and help. Thanks Mom for the wedding shower you put on for Laralyn. She went through the temple on Tuesday and that was a wonderful experience. Wednesday was spent setting up for the reception and a lot of last minute preparations. Thursday started off by driving Laralyn down to Kyle and Sarah’s so Sarah could put her hair up. Thank you Sarah, it looked great. The ceremony was wonderful and we want to thank everyone who was able to join us. Randy’s family put on a wedding lunch at Gardner Village which was just for immediate family members. It was nice to get acquainted with Rodney’s brothers and sisters. We were happy with the way everything worked out at the reception. Laurie worked hard for many weeks getting everything organized and it all came together very well. We appreciated everyone that came to celebrate with Laralyn and Rodney. We wish that people had eaten more food. We ended up with a lot of extra food which Laurie has been busy trying to give away today. Our house is now full of wedding presents. The newly weds are due back on Monday evening and then maybe we can empty out our house of wedding stuff. They went to Kanab for their honeymoon. I must say being involved in this wedding has brought back a lot of memories of when Laurie and I got married. I don’t think I ever had a clue of how much my parents and Laurie’s parents went through to pull off our wedding. It is definitely not an easy process. We are very happy for Laralyn and Rodney and proud of them for getting married the right way in the right place. Rodney is a great guy and we are happy for the addition he is to our family. Laralyn has been a wonderful daughter to raise and we are very grateful for the good example she has set for her younger brothers and sisters. We wish you all a great month of March, what’s left of it, and want to say again thanks for all your help and support. We love you all. I hope MaryAnn and Michelle both had wonderful birthdays. I know I did. Thanks Mom and Dad for the great birthday dinner. January and what we have seen of February have been full of shoveling snow. I don’t know about the rest of you, but we have mountains of snow piled up around our driveway. Today is sunny and I think the forecast is for warmer weather. I just hope it doesn’t get too warm too fast to cause flooding. I am sure you have all felt as we have the loss of our beloved prophet president Hinkley. I have been impressed with the expressions of love and affection from those who are not of our faith from around the world. He was truly a wonderful ambassador for the Lord’s church. I couldn’t help but feel grateful that he was blessed to not have to suffer a long drawn out period of poor health. It seemed as though he was able to carry out his work up to almost the last days of his life. His whole life has been a testimony of the promise made in the oath and covenant of the priesthood, “are sanctified by the Spirit unto the renewing of their bodies”. Laurie and I enjoyed the World Wide Leadership meeting held for all adults yesterday. It is good to know that the Lord’s pattern is set and won’t change with every wind of change in today’s storm of values and philosophies. For an update on the activities around our house, wedding plans pretty well fill the air most of the time and consume most of Laurie’s time. Laralyn and Rodney were able to start moving stuff into their new apartment yesterday. I believe Rodney is going to be living there until they get married. Our house was getting filled with shower gifts and Laralyn’s stuff. Now it is just full of reception stuff. Bethany has a new job, and a pretty good one at that. She works at the new Intermountain Medical Center in Murray. She works in central processing cleaning the surgery instruments. It is full time work and includes full benefits. Austin’s 16th birthday is coming soon and he thinks that is pretty cool. Macall started working at the local elementary school as a sweeper like her older brother and sisters all did. Bryce and Shane weathered the Klondike Winter Camp up at Jordanell State Park along with their dad a few weeks ago. It was cold and there was a lot of snow. Putting up spring bar tents in 8-10 feet of snow became quite a trick. Dave let us have his club 100 tickets to the Jazz versus the Bulls basketball game last night. We had a great time. What a fantastic experience it was to get to go to the dinner before the game and then sit 3 rows up from the floor. It was one of those once in a lifetime opportunities and a lot of fun. Thanks Dave. Miranda and Mollie have enjoyed getting a bunch of their big sister’s (Laralyn’s) fun hand-me-downs as she is sorting through her stuff. Until next month, we wish you all a healthy safe and wonderful time. December was quite an eventful month for our family. Most of you met the reason at the Christmas party. His name is Rodney Smith. He is marrying our daughter Laralyn. They were good friends during high school; however, they didn’t date before he went on his mission to New Jersey. He returned in October, and it didn’t take them long to get engaged. Their wedding plans are: Date-March 13th; Place-Timpanogus Temple; Reception Place-to be decided; and Colors-pink, green and brown. Laralyn has already bought her dress, which is very beautiful. I must say, it came as quite a surprise when I received a call at work from this recently returned missionary, who had been seeing a lot of Laralyn for the past few weeks, when he said he wanted to meet with me. I figured that could only mean one thing, but so soon? After agreeing to meet with him, I called Laralyn and said, “You better start talking!” She said they loved each other and wanted to get married. Laurie and I met with him a few nights later. He really is a very fine young man and there is nothing about him that is not to like. He is very respectful, kind, and loves Laralyn very much. He would have to, she can be a pretty big handful. Anyway, we are very excited for them both and wish them our very best as they prepare to start their lives together. It was cute when they came over to talk to the kids about their getting married and Laralyn started the “Send a Whisper Around the Room” game. She whispered “Laralyn and Rodney are getting married” to Mollie. She then whispered it to the person next to her. Well, none of the kids believed that what they were hearing was what Laralyn actually said to Mollie. When it came back the same as it had left, and Laralyn confirmed that it was true, it still took some of the kids a while to let it sink in. Macall was hyperventilating and after about 5 minutes, Bryce asked, “So are you really getting married?” Anyway, it was cute. Our Holidays were great, except for a little stomach flu. Of course, as usual, Laurie did all the work getting ready for Christmas and I just got to enjoy being home. She really does spoil me. Both Bethany and Laralyn were at home, so we had all 8 kids again for a few weeks. It was probably the last time our kids will all be single and at home together. Bethany started back at Utah State today. Laralyn just got a job today at Rise, a program that works with kids with disabilities. A few weeks ago, I got to go with Dave to see his cabin. That was a lot of fun. We wish you all a very Happy New Year! Merry Christmas and Winter Wonderland. What better way to get in spirit of Christmas than a good hard winter storm. November may have been fall, but December sure blew in with a winter storm. Yesterday was December 1st and it snowed most of the day. We probably got 5-6 inches of snow. The kids couldn't wait to get outside and play in the snow. 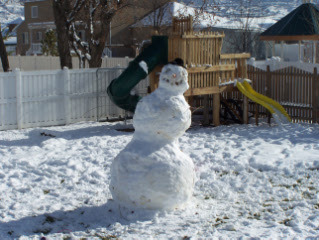 They built, while it was still snowing, an 8 foot snowman in the back yard. Definitely the largest snowman I have ever seen. The bottom ball had to be at least 4 feet in diameter. I don't know how long it will stay standing, when we got home from church today, it was leaning at about a 20% angle. Last night, the whole family, we rarely do anything as a whole family, went to the BYU folkdancers Christmas Around the World. It was very well done. Boy, there are some very talented kids down at the Y. We went because Laurie's nephew and the kid's cousin, Collin Slade, was one of the dancers in it. It was a lot of fun and it was a great way to get in the spirit of Christmas. I hope everyone had a great Thanksgiving. We enjoyed it at home with Laurie's sister, Lani, and her family joining us from Sheridan, Wyoming. It was fun to see them and spend some time together. Bethany came down from Logan and Laralyn was back and forth all weekend from Provo. Laralyn has a new job working for a telephone surveying company. It seems like in all her jobs she winds up on the phone a lot. We hope you all have a very Merry Christmas and a Happy New Year!